Casting aside Itachi’s lectures to him, Kabuto reveals he assimilated more than just Orochimaru’s DNA as he creates a construct of Sakon from the base of his navel snake through which he can use the signature attacks of the Sound Five. Although easily countering Kabuto’s attacks at first, Itachi and Sasuke find themselves trapped in Tayuya’s genjutsu so he can finish them off with an white snake Orochimaru construct. However, though a combined effort, Sasuke and Itachi escape the genjutsu and fend the snake off by casting genjutsu on each other. Kabuto, however, appears from the mouth of the snake with a surprise attack and bisects Itachi, tearfully stating his superiority before attempting to regain control over the reanimated ninja. As his body reforms, Itachi called out to Sasuke as he threw his sword at Kabuto, only for the snake sage to block and then counter. Kabuto then attacks Itachi with the sword and claimed that his genjutsu cannot affect him. 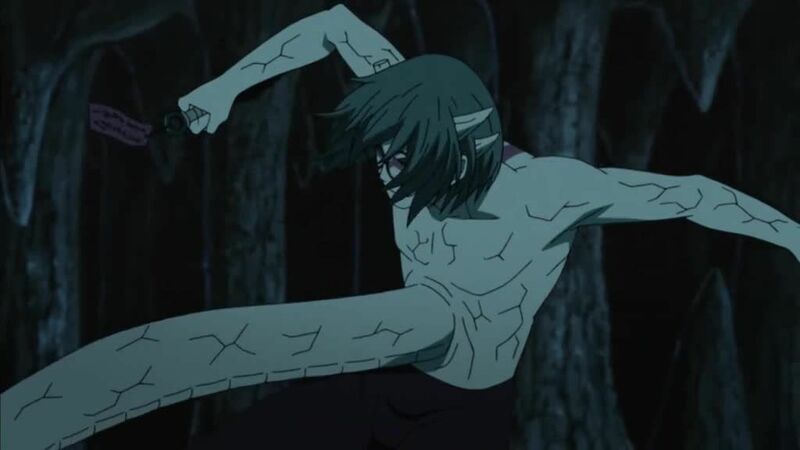 But upon realizing a sense of déjá vu in the brothers’ attack pattern, having claimed to be immune to such a trick, Kabuto learns that he is trapped with his mind via the endless loop of the Uchiha Clan’s genjutsu Izanami.